For centuries, the legal definition of lambic beer or geuze stipulated that the beer must result from 100% spontaneous fermentation. However that was amended in 1993 by a law that was sponsored by Interbrew, owners of Belle Vue brewery, and many, many others including Stella Artois (a.k.a batteur de femme). Interbrew was absorbed into Inbev which in turn merged with Anheuser-Busch, makers of the infamous imitator of the Czech pilsener beer which has to be called Budvar because the rights to the Budweiser name in the U.S.A. and several other countries belong to Anheuser-Busch who have managed to obtain a perverse legal ruling in their favour (best justice that money can buy). 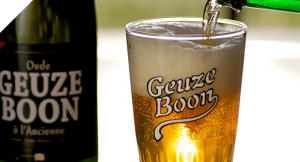 Frank Boon, together with three other lambic brewers, waged a 10-year battle to gain protection of traditional lambic beers, and in 1997 they succeeded – the European law providing protection of Geuze (lambic) “GTS” was passed, protecting traditional methods of brewing the beer. Under this protection, the word “oude” meaning, “old style,” in Flemish is reserved strictly for 100% spontaneous fermented geuze. The Interbrew-sponsored law permits the term ”lambic” to be applied to blended beers that have a lambic content of only 25%. So, if you want genuine lambic beer, look for the word “oude” on the label. The beer Shop stocks a range of genuine lambic beers from the most respected producers including Cantillon, Drie Fonteinen, Liefman. and, of course, Frank Boon. Since opening in 2011, the products on offer have been beers, ciders and perries that are not well-known brands. They are produced by small artisan brewers using traditional methods and pure ingredients. Although these are alcoholic drinks, they are consumed with the primary purpose of enjoying the taste rather than effecting a mood change. We sell locally-produced beers on draught and in bottle and also bottled beers originating in Germany, Belgium, Norway, the Netherlands and the U.S.A. We offer up to eight rotating cask beers mainly from local micro-breweries. The draught beers are sold in pint and half pint glasses for consumption on the premises, and in bag-in-box format in sizes from three litres (more than five pints) to 20 litres ( approximately 36 pints) for consumption off the premises. We also offer beers in bottle from U.K. micros and U.S.A. craft brewers plus specialists styles such as Koelsch, Duesseldorfer Altbier, Bavarian unfiltered and unpasteurised kellerbiers & smoked beers, Flemish and Walloonian (Belgian) strong pale ales, Trappist ales, wheat beers, lambic (lambiek) and fruit beers, organic stouts and pale ales from Denmark and The Netherlands. All of these can be sampled in the shop. New beer from Amundsen Bryggeri – Pale Ales, IPAs, DIPAs, DDH IPAs etc. Categories Select Category Belgium England Info U.S.A.